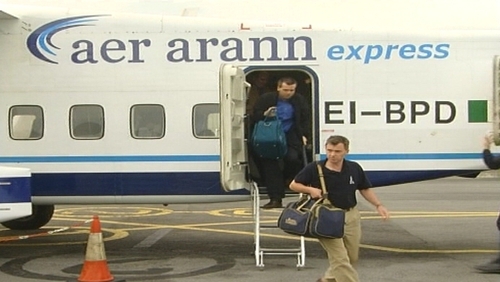 Aer Arann has announced its decision to suspend services at Galway Airport for the winter season. A full schedule will operate up to and including 31 October. Routes from Galway to Southend, Luton, Manchester, Edinburgh and Waterford are all affected. Managing Director of Galway Airport Joe Walsh said the decision was a huge blow for staff. He said there would be significant job losses as a result. He said as many as 40 people could lose their jobs out a total staff of 55. From the end of this month, flights between London, Manchester, Edinburgh and Waterford will cease to operate. The winter season is already kicking in at Galway Airport with a noticeable absence of passengers in the terminal building today. Earlier this year Aer Arann was forced to abandon regional services including its Galway to Dublin flights after Government subsidy funding was pulled. A spokesperson said the carrier was struggling for months to keep certain services running. Minister for Transport Leo Varadkar said the decision to end certain public service obligation routes was based on declining passenger numbers and a lack of government resources. The completion of a two hour motorway to Dublin was also factored in. Aer Arann says bookings are continuing to decline and all routes are projected to be loss making during the winter season. The reality, says the airline, is that it cannot continue to operate routes that are not commercially viable. Passengers, affected by the change, will be contacted by the airline. Galway Chamber, which is the majority shareholder in the airport, said it was deeply disappointed at the announcement. In a statement, it said the Government's decision to withdraw the operational subvention has made a difficult situation worse.